Churchill photographer Katie de Meulles was able to capture these haunting yet beautiful images of the iconic Ithaca shipwreck. The ship lays grounded on the rocky sea – bed 12 miles east of town in Bird Cove. When the ship grounded it was being operated by the Clarke Steamship Company to deliver nickel from Rankin Inlet. She was sailing on return north filled with supplies for the settlement when the ships rudder fractured in 80 mph winds. When the anchors failed she ran aground on September 14th, 1960 and never moved again. All 37 crew and passengers aboard were rescued. Because the Hudson Bay is shallow along coastal areas the waves are less likely to break old wrecks apart during storms. These intriguing shots are unique with the northern lights glimmering above the rusting hulk.The beauty blends with the symbol of tragedy to stir mixed emotions in the viewer! MV Ithaca in Churchill. Katie de Meulles photo. Northern lights above the MV Ithaca. Katie de Meulles photo. Erie view of the MV Ithaca in Churchill. Katie de Meulles photo. Darkened mass of the MV Ithaca in Churchill. Katie de Meulles photo. MV Ithaca with glowing aurora borealis in the sky above. Katie de Meulles photo. MV Ithaca with a strand of northern lights behind. Katie de Meulles photo. MV Ithaca under the aurora borealis in Churchill. Katie de Meulles photo. If you have been to Churchill you have more than likely seen the infamous Ithaca shipwreck just off the coast heading toward the airport or polar rover launch-site. 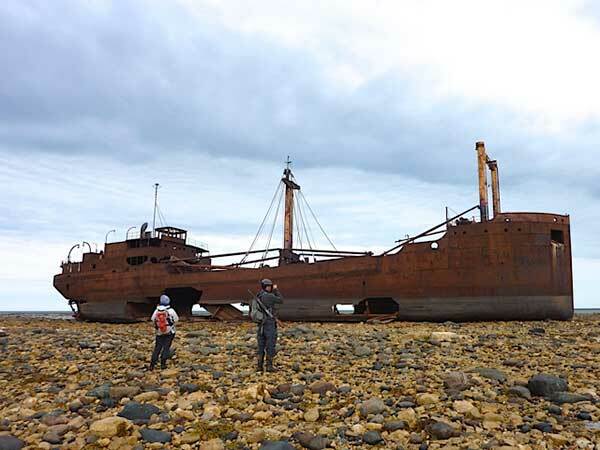 The ship rests on the sea-bed 12 miles east of Churchill in Bird Cove. Built in Three – Rivers, Quebec the Ithaca is eighty meters in length. Operated by the Clarke Steamship Company to deliver nickel concentrate from the works at Rankin Inlet, she sailed from Churchill on 10 September 1960 to collect her cargo, carrying supplies for the settlement. The ship’s rudder fractured in an 80 mph gale force wind and when anchors failed to hold she ran aground on September 14, 1960. The vessel came to rest on the rocky shoals, where it sits today, and all 37 men aboard were rescued. Low tide often allows locals and travelers to walk out to the wreck and gain a close-up vantage point of the rusty behemoth. You will need to keep an eye on the tide chart however as you might end booked in a “rustic” cabin heading nowhere fast. It has happened. There’s a bit more history of the Ithaca but this is the main crux of the wreck. It stands in the Hudson Bay as a monument to all those seamen that have traveled the waters of the north.